What interview questions for a network engineer is going to prepare? Maybe we can list a lot of basic questions, such as the administrative distance of EIGRP, eBGP, iBGP, what a 3-way handshake is in TCP, DHCP features, a stateful firewall, HSRP, STP, VTP, VLAN, Features of EIGRP, OSPF, etc. 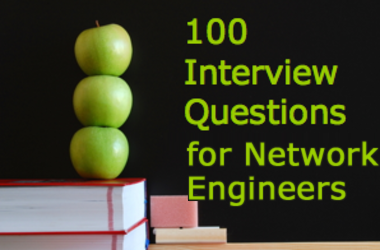 Here we collected top 100 interview questions for Network Engineers and Administrators. Are you familiar with them? Check now! Q8. What does the Mount protocol do? Ans. The Mount protocol returns a file handle and the name of the file system in which a requested file resides. The message is sent to the client from the server after reception of aclient’s request. Ans. It is a host that has a multiple network interfaces and that requires multiple IP addressesis called as a Multi-homed Host. Ans. It is a system that performs a protocol translation between different electronic mail deliveryprotocols. Q73. What are major types of networks and explain Server-based network and Peer-to-peer network. Notes: All right, the answers for these questions are not typical and detailed. We just list the main topics that network engineers need to know well. More info and tips you can find and check by yourself according to your situation.